Save the Snail HD is an iPhone game developed by Alda Games. This free puzzler has 24 levels, and is really quite addictive. In Save the Snail HD, you will need to complete a number of physics-based puzzles. 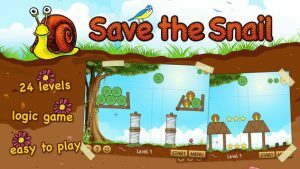 Your ultimate goal, naturally, is to save the snail (or snails) that are on your screen. Rain, sun, and the elements will fall down upon the snails. Your job is to provide them with shelter. 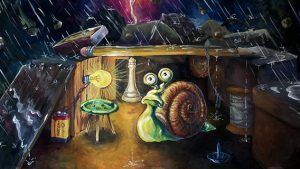 To shelter the snails, you need to drop objects down onto platforms. A few spools, a matchbox, and a couple of pencils: and voila! A makeshift shelter has been made! If you really want to challenge yourself, you can try and get a three-star rating on all the levels. To get a three-star rating, you must complete the level within the allotted time, gather any bonus objects that are present, and (of course) save the snails on the screen! 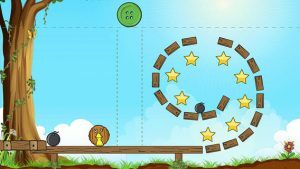 Suitable for both kids and adults, this beautifully drawn game has addictive physics puzzles that have multiple ways to be solved. 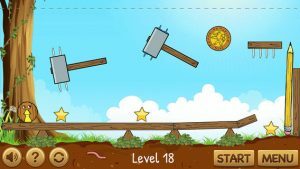 This game would be a great way to get kids thinking about either physics or the natural world. There is great replay value here, which is good because the game honestly seems to be a little bit on the short side. Still, overall, this game is really tons of fun. If you love physics-based puzzles, this is absolutely a must-play. Save the Snail HDis compatible with iPhone 4, iPhone 4S, iPhone 5, iPod touch (4th generation), iPod touch (5th generation), iPad 2 Wi-Fi, iPad 2 Wi-Fi + 3G, iPad (3rd generation), iPad Wi-Fi + 4G, iPad (4th generation), iPad Wi-Fi + Cellular (4th generation), iPad mini and iPad mini Wi-Fi + Cellular. Requires iOS 4.0 or later. This app is optimized for iPhone 5.